Copper has been used to make cookware for thousands of years and with good reason. It’s reliable, heats up quickly and maintains a consistent temperature which is really important when frying or boiling. The oldest examples we have of copper cookware date back to 900 BC with fragments of pots and pans being dug up across the middle east. Not all copper cookware is made equal however. To get the most out of copper a manufacturer must understand how to hammer the metal and craft it for optimum results. 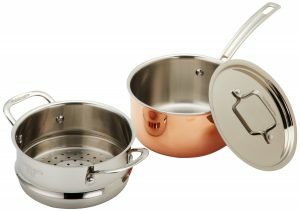 Below we have reviewed three fine examples of the best copper cookware available. 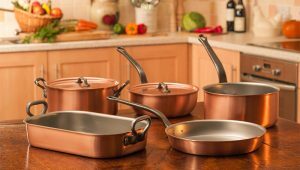 We have conducted several copper cookware reviews and the three listed below are our recommendations for those looking for the best quality, the best value for money and the best available for those on a budget. This is considered by us the best copper cookware on the market! For those looking for the very best in copper cookware it’s really difficult to go past the Lagostina Q554SA64 Martellata Tri-ply Hammered Stainless Steel Copper Oven Safe Cookware Set. The thick aluminum core and stainless steel exterior means the pots and pans in this set heat up fast and distribute their heat nice and evenly. The copper coating on the exterior of the pots and pans meanwhile gives you excellent temperature control and allows you to keep your pans hot for longer. You will never have to worry about burning yourself with these units as they feature stay cool handles so they won’t heat up when the rest of the pan does. These copper pots and pans are heat resistant to 500 degrees and are oven and metal utensil safe. For those looking for the best of the best they will definitely be wanting to take a closer look at the Lagostina set. For those looking for the best value for money however we recommend the Cuisinart CTP-11AM Copper Tri-Ply Stainless Steel 11-Piece Cookware Set. While it doesn’t offer everything that the Laostina set does, for the money you’re spending the the Cuisinart set gives you the most bang for your buck. Its triple ply construction means it will heat up to and maintain your desired temperature quickly and efficiently. It also means that they are oven safe up to 500 degrees making them ideal for items which you need to fry then bake. The copper exterior means that the units cool quickly allowing you to clean and reuse them in quick succession. Heat surround technology which is built into the base and walls of the pans means heat distributes evenly across the entire item of cookware which ensure you can get consistent results. The handles stay cool during cooking even when exposed to open flames and are comfortable to hold and maneuver. If you’re on a budget but are still looking for high quality copper cookware than our recommendation is the T-fal C836SC Ultimate Stainless Steel Copper Bottom Cookware Set. 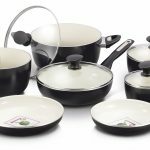 This 12 piece set is affordable and doesn’t sacrifice performance, so if you are looking for something cheaper then the above two options than the T-fal set definitely deserves your attention. 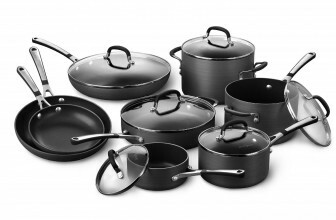 The 12 pieces in this set are made from durable stainless steel and are built to last. Their multi-layered copper base distribute heat evenly and consistently ensuring great results every time you cook. Featuring heat resistant ergonomically designed handles these units are made for comfort. All pots and pans in this set come with glass lids which feature a vent hole to allow steam to escape and prevent boil overs. This set can be used on a range of burners including induction burners and can also be used in an oven at temperatures up to 500 degrees. 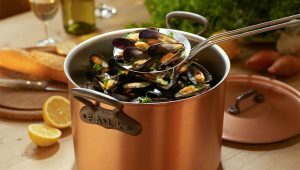 So why should you choose to use copper cookware? There are three key advantages that copper has over other types of cookware and I’m going to list them below. The first is that copper heats quickly and distributes heat evenly across the pot or pan. This is because copper is a really good heat conductor and it’s why copper has been used in cooking for so long. While it’s true that most modern cookware is capable of distributing heat evenly, it’s rare to find teflon based cookware which doesn’t create hot spots ( areas in a pan which are hotter than the rest of the cooking surface). The problem with hot spots is that they lead to uneven cooking. If you’re a chicken for example a hot spot may mean that part of your chicken cooks faster than the rest causing it to burn. With copper cookware hotspots are pretty much unheard of. This is why many high quality chefs will only ever allow copper in their kitchens. The other advantages of copper are its weight and its looks. Copper weighs enough so it will be stable on burners but doesn’t weigh so much that it becomes problematic to move. It also looks stunning, especially when compared to other types of cookware. 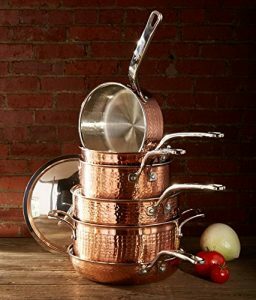 We recommend copper cookware for experienced and inexperienced chefs alike. If you’re trying to achieve high quality results than the ability of copper cookware to conduct heat and keep it will likely take your cooking to the next level. So when you’re buying copper cookware what should you be on the lookout for? The most difficult thing to tell is if the copper is high quality. If it isn’t than it won’t heat properly or evenly leaving you with a less than ideal cooking surface. The best way to ensure you get quality is to buy a recognisable brand with a good reputation. Every item reviewed in this guide come from reputable brands, so you’re pretty safe if you go with one of the reviewed cookware sets. You should also be on the lookout for a shiny finish. Not only does a shiny pan look better than a dull one, a poor finish can be a sign of a poor quality. If effort has gone into the exteriors, than it normally means that effort has gone into cookware itself. 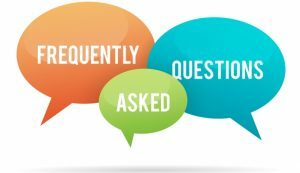 Other things you should be checking for are whether or not the cookware is oven suitable, whether it can be washed in a dishwasher and whether or not the surface is scratch resistant. None of these things are obviously essential but they are all worth knowing before you decide to make a purchase. 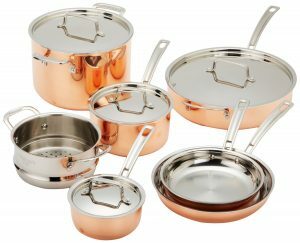 The first copper cookware set we are reviewing is the 10 piece Lagostina Q554SA64 Martellata Tri-ply Hammered Stainless Steel Copper Oven Safe Cookware Set. This is the set we recommend buying if you’re after the highest quality product on the market. We will go through the specifics of why this is the case in a second but in short it’s because it delivers the best results and is the most durable of any copper cookware we have tested. If you’re looking cookware that the professionals use than this in the set you’re after. So what exactly do you get when you purchase the Lagostina set and why is it worth paying top dollar for. Well The Set includes an 8 inch skillet, a 10 inch skillet, a 2qt saucepan with lid, 3qt saucepan with lid, a 3qt deep saute pan with lid and a 6qt stockpot with lid. All your basics are there so you should have no problems using this set to create a wide variety of dishes. We personally would have liked to see a couple more saucepans included to make simultaneous cooking easier but for some reasons that just isn’t typical of what’s for sale right now. It’s the make of the pots and pans in this set that really set them apart from the competition. The product description for this set claims that premium aluminium was used in its construction and you can tell that’s the case by the look and feel of each individual piece. It also claims that each pan and pots features a thick heat radiating core which heats rapidly and then distributes that heat across the entire piece of cookware. This two is noticeable as each piece heats and is ready for cooking in record time. The copper finish on the pans is stunning and is probably one of the sets biggest selling points. Copper cookware can come across as either bland or artificial but that’s not the case with this set. The shining finish on these pots and pans will mean you can display the proudly and they are sure to add a touch of class to your kitchen decor. One of our favourite things about this set was the handles. They are uniquely shaped but felt comfortable in the hand and gave great control when lifting heavy pots. It’s probably one of the most underrated features of cookware but I would argue it’s one of the most important. If you are going to be spending any time at all cooking on a stove it’s vital that the cookware your using feel good in the hand and safe to maneuver. Dodgy handles can not only be uncomfortable but they can also be a major safety hazard. That’s why we were so impressed by the handles on this set. Clearly some thought had gone into them. We also really liked the weighting of these pans. They are not too heavy to lift but they are heavy enough that they don’t feel flimsy. Getting this balance right is something other cookware manufacturers really struggle with for some reasons. Likewise the lids included in this set felt sturdy and fit tightly. Other reviews indicated that they felt the lids let the cookware down but we don’t believe that to be the case. While it’s hard to find fault with this set, if I were speaking to the manufacturer my one recommendation would be to use glass lids. There is no excuse anymore for not having lids which you can see through. Constantly having to lift the lid of a pot to see what’s happening inside is a nuisance and it allows precious heat to escape. This is however a pet peeve and a personal preference rather than a fault with the product. In summary, we recommend this copper cookware set because it delivers on two fronts. It cooks quickly, efficiently and evenly and it’s easy and feels great to use. The fact that it looks stunning is an added bonus. If you’re looking to spend top dollar than this is the set you want to buy. Is it more expensive than the other sets we are reviewing? Yes, but the reality is you get what you pay for. The next set we are going to review is the one we recommend if you’re looking for a copper cookware set which will deliver value for money. While this isn’t the best product available, it’s is in our opinion the one that represents the best value for money. So which set is it? It’s the Cuisinart CTP-11AM Copper Tri-Ply Stainless Steel 11-Piece Cookware Set. We picked this set because of the quality of the make of each individual item and because the features it includes are what you might expect from a much pricier product. So if you are looking for value for money than I highly recommend you read the review below. So firstly what does this set include. It comes with 1-qt saucepan, 2-1/2-qt saucepans, 5-qt sauté pan with helper handle, 8-qt stock pot lids; an 18cm steamer insert; an 8-inch skillet and an 10-inch skillet. Basically it provides everything you will need to create a wide variety of dishes. 11 pieces is fairly standard for sets in this price range but the variety in this set is a point of difference from its competitors. The make of each individual item feels solid and durable. This is likely because each piece in this set is made from triple ply construction. What this means is basically is that we separate layers of metal were merged to create the final product. This not only creates a super strong finish, it also increases the speed with which the item conduct heat. The items in this set heat up fast because of the triple ply. Not only do they heat quickly however they also distribute the heat nice and evenly. This is because each pot and pan in the Cuisinart range makes use of heat surround technology which allow the walls and floors of a pot of pan to heat at the same rate. Other products in this price range don’t deliver as good results in this regard with hot and cool patches often being noticeable. One of the things we really liked about the Cuisinart copper cookware set was that it was super easy to cook sticky items on providing appropriate amounts of oil was used. Remember copper cookware is not nonstick and should not be used as such. However some surfaces are less nonstick than others and I’m happy to report that the surface on these pans was really good for cooking items you might expect to stick and burn in other pans or pots. Making pancakes for example was still very easy, even though that’s not really what copper was designed for. As long as you grease the pan before cooking and use a generous amount of butter or oil you should not have any issues keeping your food from sticking to the pots and pans in this set. Another feature we really like is that the items in this set are rated for temperatures up to 500 degrees fahrenheit. Most sets in this price range are only rated from around 300 – 400 degrees fahrenheit. This extra heat durability will mean that you can place the items in the oven and have no fear that they will warp or melt like some cookware has been known to. We also appreciated the stay cool handles and noted that they did infact stay cool even when exposed to an open flame from a gas burner. The downside of this set was how easily they maked. We Found that unless they were dried immediately after being washed than some discoloration began to occur. We also noticed marks after cooking at high temperatures. Others have reported that the surface scratches easily when using metal utensils so if you are going to use metal with this set exercise caution and be gentle. Overall though we really like the Cuisinart copper cookware set. 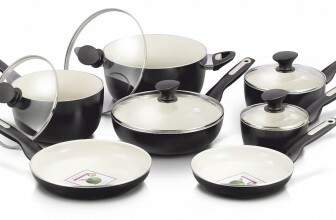 This is a professional standard cookware set and is a steal for its current retail price. It cooks easily, its looks stunning and is about as non-stick as you can expect a copper cookware set to be. That’s why we are recommending the Cuisinart is your looking to get the best return possible on your money. The final copper cookware set we are going to review is the 12 piece, silver T-fal C836SC Ultimate Stainless Steel Copper Bottom Cookware Set. This set is the cheapest item we have reviewed and is the one we recommend for those on a budget. Just because this set is cheaper however doesn’t mean it’s a substandard product. It is included on this list because of its quality in spite of its relatively low price. It delivers in terms of its performance, durability and looks which is why we chose this set over other comparable copper cookware sets in this price range. The set features 12 pieces and includes everything you would expect to find in a regular cookware set. It’s north noting that for the same price some high end pots cost, you get 12 pieces when you purchase the T-fal copper cookware set. 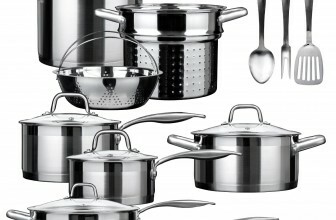 The core of the pots and pans in this set are made from stainless steel. Steel is often coupled with copper and in combination the two create fast heating and durable cookware which is ideal for the average home. The copper base of the pots and pans in this set ensure that each item heats quickly and evenly and doesn’t allow for hot spots to occur. One of our favourite features that the T-fal set includes is its interior measuring markers. Its really handy to be able to directly measure precisely how much water you to add to a pot and not have to use a separate measuring device first. Its also really handy when cooking foods which absorb water such as pasta as often the water level can be a good indication of whether or not something is ready to be taken off the boil. Another feature we really liked that the previous two reviewed sets did not feature is glass lids. Glass allows you to keep an eye on your cooking while the lid is attached. This is convenient and allows you to observe what’s going on with your cooking without forcing you to let precious heat escape. This is hardly a ‘must have ‘ feature but it’s just one of those things which makes your life so much easier when cooking multiple items at once. Also working in this sets favour is that like the above to sets it is both dishwasher and oven safe. The same cannot be said for some other affordable options. The downside to this set is that it uses less copper than more expensive options. This means it just heats up slower and is harder to keep really hot. This unfortunately is just the trade off for it being cheaper than the above two options. The good news is that the above issue is probably only important if you’re a high quality chef looking for high end cooking utensils. For the average household and the average cook, the slower heat times probably won’t cause that much of an issue. So if you are on a budget than the T-fal set is definitely worth looking at. While not as advanced as the other two items reviewed on the list it still gets the job done and delivers excellent results. 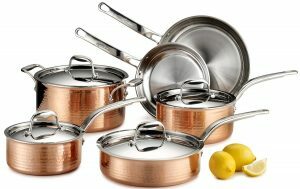 If you’re just looking for family cookware and want to try copper than the T-fal set is a great place to start. Why is Copper used so commonly for cookware? Originally Copper was used because it was a common and relatively cheap. It was also easy to forge and manipulate. Today copper is used because it’s a great conductor of heat and a great distributor of heat. This means that the burner not only heats the bottom of the pan but also heats up but the sides as well. Copper is also used commonly used because unlike other metals it is highly unreactive. This means that it will stay stable even when it’s exposed to extreme heat and other chemicals. Where is copper cookware made? While a lot of copper manufacturing these days is done in china, it varies from set to set. Check with the manufacturer to find out specifically where there cookware is constructed. Often you will find different elements are made in different places? Will copper cookware work with my inductive stove top? The short answer is no. The long answer is that inductive stove tops only work with magnetic cookware. This is because it uses a magnetic system to generate heat. If you have an inductive stove top or you’re considering getting one then we highly recommend you purchase a stainless steel set which specifically says that it works with induction stoves. Is it safe to put copper cookware in the dishwasher? As always the best place to find answers about your specific cookware set is in the instructions that it came with. These can also usually be found on the manufactures website. 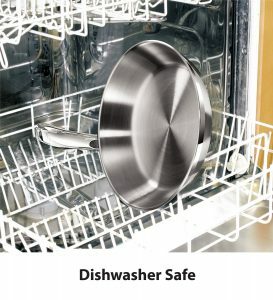 As a general rule copper cookware should hold up fine in most home dishwashers. The only likely downside is that the copper exteriors may tarnish if you machine wash them repeatedly. How much you care about this possibility is really a matter of personal preference. Does copper cookware need to be polished? All copper needs to be polished occasionally if you want it to stay shiny. Continued use will mean that copper pots and pans will tarnish eventually. Again it’s really a matter of personal preference how much effort you put into polishing. If presentation is really important to you than regular polishing should keep your cookware nice and shiny. If on the other hand you really only want the cookware for practical purposes than not polishing will not affect its ability to do its job. As a general rule no, copper is not nonstick. Some sets do however use a combination of copper and other material to make them non-stick. When cooking with copper just ensure that you use an appropriate amount of oil, butter and cooking spray and you should have no issues. Be prepared to adjust your cooking temperatures – One of the things that some people aren’t prepared for when they start cooking with copper is just how quickly it heats up. If you use the same sort of temperatures that you need to use for other types of cookware than you are liable to burn your food and cook it onto the pan. A really good rule of thumb is to only use half of the temperature that you usually use. If you find that the temperature isn’t hot enough than you can adjust upwards but it’s always a wise idea to start low and only turn up the temperature when it’s required. You don’t need to buy an expensive polish to look after your cookware – Contrary to popular belief tarnish won’t damage your cookware, in fact it will actually help protect it from wear. So if you’re not worried about looks than you needn’t worry about polishing at all. If on the other hand you do want your copper cookware to remain presentable than I highly recommend trying to use lemon juice, tomato juice or vinegar before rushing out and buying an expensive bottle of copper polish. Anything which is mildly acidic should get your pots and pans sparkling again in no time. Just make sure you wash your pots and pans in soapy water after every polish Also note that the interior of any copper pan will darken over time. This is natural and unpreventable. Don’t bother trying to polish it because you won’t have any effect in the long run. Always let pans with baked on foods soak before scrubbing – Most copper pans cooking surfaces are made up of several very thin layers of metal. If you scrub the bottom of the pan you risk scratching away these layers and damaging the effectiveness of the pan. If food cooks on soak the pans for several hours in warm soapy water. Then when cleaning them always ensure you use the soft side of a sponge to actually remove the stuck on food. Try avoid overly acidic or salty foods if possible – Copper , like any metal will corrode if exposed to acids for long periods of time. For this reason try avoid using copper cookware to fry overly acidic foods or you may find that your cookware doesn’t last very long. While cooking a very salty dish for example occasionally probably won’t do much harm continual or repeated use could lead to permanent damage so just be cautious when cooking potentially corrosive foods. Copper cookware has been used for thousands of years and there is no reason why shouldn’t start using it as well by purchasing one of the above products. Copper heats fast, distributes it evenly and can deliver restaurant quality. It is a little harder to use than some other types of cookware but it is definitely worth learning how to cook with copper. In the long run it will improve your food and deliver better results than just about any other type of cookware. Like I said previously, there is a reason so many professional chefs choose copper cookware. So if you want to take your cooking to the next level, copper is definitely the way to go.